Home / pregnancy / WHAT CAUSES DIZZINESS IN PREGNANCY? WHAT CAUSES DIZZINESS IN PREGNANCY? Normally, our bodies can handle the changes that pregnancy brings. However, there are times that the body may not be able to keep up with the changes and it will leave you feeling dizzy or faint. 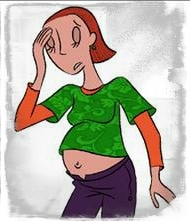 The main cause of dizziness in pregnancy is due to the rising hormones that cause your blood vessels to relax and widen. This helps increase the blood flow to your baby, but it slows the return of the blood in the veins to you. This causes your blood pressure to be lower than usual, which can reduce the blood flow to your brain, temporarily causing dizziness. Dizziness is also caused by low blood sugar levels that may occur as your body adapts to changes in your metabolism. Women who are anemic or who have varicose veins may be more susceptible to dizziness than others. During the second trimester, dizziness may be caused because your growing uterus puts pressure on blood vessels. Dizziness may also occur later in your pregnancy if you lie on your back, allowing the weight of the baby to press on your vena cava (a large vein that carries blood from your lower body to your heart). If you begin to feel dizzy or lightheaded, you should lay down to avoid falling down and hurting yourself or the baby. The best position to lay down is on your left side because it will get the most amount of blood to your heart and brain. Sometimes it is not possible to lay down and in that case, you should sit down and place your head between your knees. When you are laying down, sit up with your legs dangling for a moment before standing up. Stay hydrated and drink plenty of water and fluids throughout the day. Do not take hot baths or showers. Exercise slowly and in moderation. Eat several small meals throughout the course of the day to keep your blood sugar levels consistent. Do not lie flat on your back. Lay on your side instead. This can cause your heart rate to increase your blood pressure to decrease. Eat foods that are rich in iron and ask for an iron supplement if you are anemic.